You may determine that your baby is ready to start eating solid foods when she is around age 4 to 6 months. If family members have food allergies, talk with your child's pediatrician about your baby's risk for food allergies. Before you give your baby solid foods, know the signs of an allergic reaction like swelling of the eyelids and other parts of the face. This will help you identify a problem early so that you promptly can seek medical treatment if necessary. A reaction to baby food or other foods you give your child may include eyelid swelling. Additionally, your baby may have inflammation around her mouth or otherwise on the face. She may have a rash or upset stomach that will cause nausea and vomiting. In serious reactions, you may notice that your child has difficulty breathing; this requires immediate medical care. 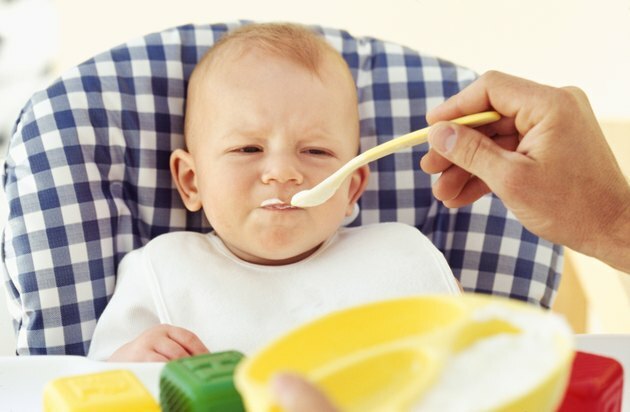 If your child has a mild reaction to baby food, the pediatrician may recommend an antihistamine or other over-the-counter product to help reduce eyelid swelling or other symptoms. In the case of severe reactions, your baby may require epinephrine injections or other treatments to counteract the reaction and clear his airway. At the first sign of an allergic reaction, contact a pediatrician or go to the nearest emergency care center, as prompt medical treatment may prevent a severe reaction. Eyelid puffiness that does not accompany other symptoms may not require treatment. Depending on the inflammation's severity, your child's pediatrician may recommend that you give your child over-the-counter ibuprofen to reduce swelling, or the doctor may recommend applying a cool, damp cloth to your baby's eyelids. Your child may not keep the cloth in place for more than a few minutes, but the cool cloth may offer some relief. If swelling persists, the pediatrician may recommend an allergy eye drop or oral medication to help reduce eye-related symptoms. A family history of food allergies could indicate a possible reaction in your child. If you know of certain foods that could cause a reaction, talk to your child's doctor. She can help you find alternative foods or have you give your child a taste of the food while in the doctor's office to monitor for symptoms of a reaction.